Rock ‘n Roll will never be the same with the Tululele, which combines the sound of an acoustic uke with the look of a classic electric guitar. 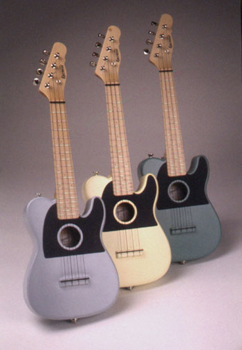 With a hollow ash body, a bolt-on maple neck and a concert scale length (14 7/8″), the Tululele pumps out plenty of acoustic sound and also plugs in to your favorite amp for a hot acoustic/electric effect. 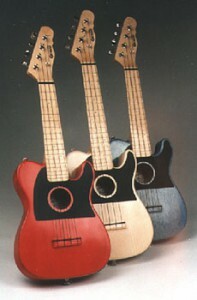 The Tululele is available in “Ruby”, “Blondie”, or “Bluey” (custom colors and finishes also available – see below) and includes a standard piezo soundboard transducer, and a plush lined chipboard case.